Banff, Alberta, is a popular tourist town in western Canada. The town is part of Banff National Park, tucked into the Canadian Rocky Mountains. Banff - the town and park - attracts visitors year round for its skiing and other winter sports, hiking and camping, hot springs and overall beauty. Located off the #1 Trans Canada Highway, the town of Banff is just under 4 square kilometers and home to about 8,000 residents. Banff is in the southwestern corner of Banff National Park - Canada's first and most visited national park. The town has many hotels, restaurants, shops, as well as a post office and hospital. The town of Banff strictly controls its commercial growth to ensure it does not overwhelm the pristine surrounding environment. The Town of Banff is located in the southwest corner of Banff National Park, Alberta, Canada. It is 128 kilometres (80 miles) west of Calgary, 401 kilometres (250 miles) southwest of Edmonton and 850 kilometres (530 miles) east of Vancouver. Driving access to Banff is via the #1 Trans Canada Highway. The Calgary International Airport is a modern facility that handles airlines from around the world and the most convenient airport from which to visit Banff. Driving time from the airport to Banff takes less than 90 mins. Airport charters and shuttles as well as car rentals are available. Banff is easily accessible by Hwy 1, the Trans-Canada Highway. Because the town of Banff is inside Banff National Park, you will need to purchase a national park pass at the Park gate. Established in 1885, Banff National Park is Canada's first and largest national park spanning 6,641 square kilometres (2,564 square miles) of valleys, mountains, glaciers, forests, meadows and rivers. Together with Jasper, Yoho and Kootenay national parks and four adjacent provincial parks, form the UNESCO Canadian Rocky Mountain Parks World Heritage Site - one of the largest protected areas in the world. 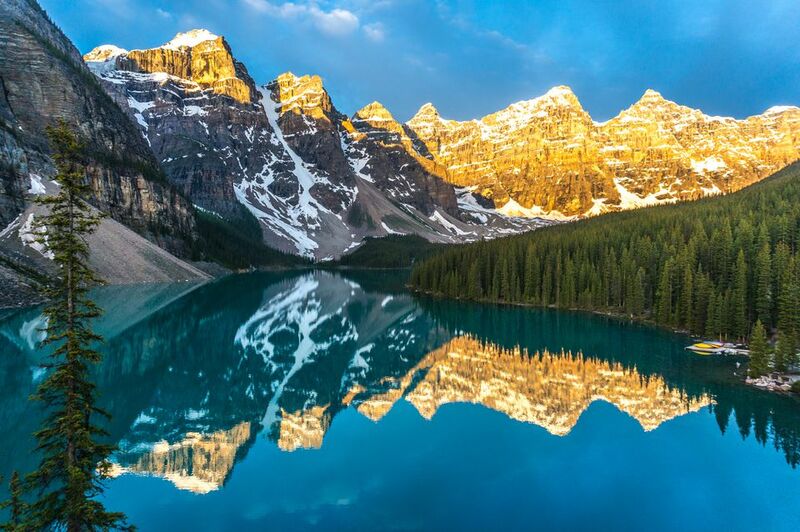 Banff National Park is visited by 4 million people every year for its wide range of year-round outdoor activities, natural beauty and world-famous Banff Springs Hotel. All visitors must buy a permit at the park entry gates. Banff / Lake Louise skiing is spread over three resorts: Mt. Norquay, Sunshine Village, Lake Louise Mountain Resort. In a single tri-area lift ticket you gain access to all three with free transportation to and from the resorts. The area enjoys one of the longest ski seasons in North America, from mid-November to late May. Soak in Banff's Upper Hot Springs - a spa and bathhouse that has soothed travelers since the 19th century. Get a panoramic view of six surrounding mountain ranges from the Banff Gondola. Giant, ancient glaciers, frozen mid-slide can be explored at the Columbia Icefields, actually located within Jasper National Park, about 3 hrs away. Stay or just have a drink or high tea at one of the two historic local Fairmont hotels, the Banff Springs or nearby Chateau Lake Louise. Forty-five minutes away, Lake Louise is a lake, village, and ski resort. Many other points of interest and national park are within a few hours drive. Check the Town of Banff for more info. Average temperature during the winter months is around -12º C (6º F); however it is not unusual to have a two-week cold snap during December or January where temperatures plummet into the -30º C (-22º F) range. Warm chinook winds may bring relief. Lasting snow starts in November, with peak snowfall in December. Spring temps are similar to fall. Rainy days begin in May and continue through August, with June getting the most. Summers are warm with long daytime hours. Average highs are about 21º C (70º F) with night-time lows around 7º C (45º F). July is Banff's warmest month. Fall daytime temps stay above zero with night time temps hovering around freezing. Banff is a year-round destination. The area is known especially as a great ski destination but it draws people from all over the world for its camping and hiking. Basically, you get stunning scenery no matter when you visit, whether it's crystal blue lakes, golden fall Aspens or snow peaked mountains for as far as the eye can see. Visitors from outside of Canada will need to check the passport requirements and visa requirements. The closest airport is the Calgary International Airport. Much of Banff's charm is its natural surroundings, so the town wisely keeps its commercial growth in check. Large chain hotels are scarce. Instead, moderately sized, privately owned hotels, motels and lodges are the norm. Banff's Climate Season by Season.